The Small Town Girl: Give Me My Rose-Coloured Glasses Back! Give Me My Rose-Coloured Glasses Back! The moment of truth. That moment in life, when you hit a realization so strong you want to shut your eyes tight and tell yourself it didn’t happen. It could be the appearance of fine lines under your eyes, or the disappearance of romance from your marriage. It could be living with a job that gives you no satisfaction, or living without your beloved rose-coloured glasses. Those glasses that made the amusement park seem like the best place in the World, wearing which candy floss & cola ice seemed better than 5 star dinners, when daddy knew the answers to all your questions and mommy knew the solutions to all your woes. When the biggest confusion in your life was whether you should become the next Indira Gandhi or the next Kalpana Chawla, where nothing seemed impossible, or even difficult. When you ranted passionately on things like dowry, and child labour, and female foeticide and believed with all your heart that you would grow up and set everything right. It is a big loss- the loss of these glasses. As I heard young students from India and Pakistan talk ardently about ideas for peace- the culture, the art, the trade, the warmth between the estranged neighbours being beautifully articulated, interspersed with Hindi and Urdu poetry, and all I could think about was my waitlisted rail ticket, my unread e-mails, and my upcoming appraisal, I realized that I had been converted. 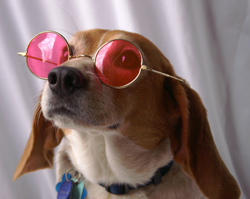 Someone stole my rose-coloured glasses, and left me with no choice, but to become a cynic. And so at this moment of truth, I pause, I take a deep breath and look at myself. I realize that there isn’t enough. I am either not rich enough, or not thin enough, or not smart enough to do all the things I want to do. The guilt of a chocolate truffle takes me to the gym, and guilt of an expensive MBA takes me to the office. I am either too bored, or too busy. There’s something that I am constantly running for, and yet I never find it. I no longer believe in the government, or the Gurus, or the Gods. Nothing natural or inexpensive looks pretty anymore. The rain is what brings traffic jams, and the sun is what enlarges my electricity bill. I have begun to believe that people are by their very nature selfish, spiteful and sadistic. And so I don’t smile at strangers now. It seems like everyone is a rival, an enemy. I try hard to protect myself, my money, my job, my apartment, my loved ones. And so I put myself in a shell, and don’t let most people come through. I don’t let the stomach butterflies alone make me fall in love. I hold back, I calculate and I reason out. I crib, and crib, and crib more- about inflation, inequality, crime, deceit, shallowness, malice. And I don’t think any of it can be set right, ever. It’s a huge loss, possibly irreversible. And what makes one so bitter? I believe it comes with growing up. For me, this term has been synonymous to my tryst with Marketing. Ever since I have been on this side of the table, things have been losing their charm, one after the other. We marketers sell to you all the things you can buy- expensive watches, perfumes, shoes & bags; and just when you start feeling guilty enough, we sell to you charities, abstinence and meditation. We run a campaign asking you to love thy neighbour, to be nice to the people around you- we shout it out loud, on TV, newspaper, hoardings, internet; and yet within our own organizations we act like crabs, always trying to pull each other down. We sell to you all that you can take- from skimpily dressed women for your physical needs to underprivileged children for the emotional ones. We don’t care how they affect you; we sell them because you buy them. We look at you morons and laugh- when you buy things like a red Santa Claus or a pink mobile phone, things like Valentine’s day and Chamakti safedi. Yes we laugh, but what we probably don’t realize is that the real joke is on us. The terms & conditions in the fine print of my appointment letter did not mention how the marketing games sometimes backfire on the marketers. How we, the people on this side of the table, who make a living out of fooling people into buying stuff; we better shun our holier than thou attitude, because in the process of Marketing, we have lost the most precious thing in this World. We have lost our rose-coloured glasses. don't blame yourself & industry for all your efforts to sell. you forgot to tell most precious part of this industry. you sell desires to make someone feel good. you sell ideas which is a mixture of real and imaginary hope. Marketing is a field where you let everybody to see from your rose coloured glasses & make them feel more optimist, more satisfied & more happy. find happiness in other's joy.